Bannochie Builders, Inc. can help create your dream kitchen no matter what size or style of kitchen you have in your Edina, MN home. We have a team of skilled craftsmen who can offer expertise that works with just about any budget. Smart Upgrades can maximize the function and style of an outdated kitchen space. Room Additions or removing a wall creates a grand living space with unlimited possibilities. A beautiful new Kitchen back splash can have a big impact on your kitchen design. There are so many options available that it can be difficult to choose just one. As a Licensed Remodeling Contractor, Bannochie Builders, Inc. can help you to create a back splash that coordinates beautifully with your counter tops, cabinetry and flooring and is perfect for your new kitchen remodel. Bannochie Builders, Inc. is a Licensed Remodeling Contractor that provides Expert Remodeling Solutions. We have decades of experience with Kitchen Renovations that transform an outdated space into the Kitchen of Your Dreams. Your personal style can be showcased in the design choices that you make. Our skilled craftsmen can provide your Edina, MN home with new counter tops, flooring, cabinets, lighting, backslash, island and much, much more. 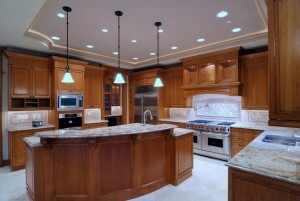 Contact Bannochie Builders, Inc. today for a Free Estimate on your Edina, MN Dream Kitchen Renovation. This entry was posted	on Tuesday, February 24th, 2015 at 9:14 pm	and is filed under Kitchen Remodeling. You can follow any responses to this entry through the RSS 2.0 feed. You can leave a response, or trackback from your own site.